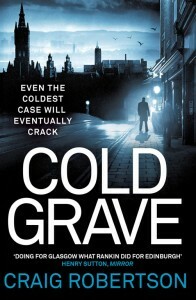 Even the coldest case will eventually crack. November 1993. Scotland is in the grip of the coldest winter in living memory and the Lake of Menteith is frozen over. A young man and woman walk across the ice to the historic island of Inchmahome which lies in the middle of the lake. Only the man comes back. In the spring, as staff prepare the abbey ruins for summer visitors, they discover the unidentifiable remains of the body of a girl, her skull violently crushed. Twenty years later, present day. Retired detective Alan Narey is still haunted by the unsolved crime. Desperate to relieve her father’s conscience DS Rachel Narey returns to the Lake of Menteith and unofficially reopens the cold case. With the help of police photographer Tony Winter, Rachel discovers that the one man her father had always suspected was the killer has recently died. Risking her job and reputation, Narey prepares a dangerous gambit to uncover the killer’s identity – little knowing who that truly is. Despite the freezing temperatures the ice cold case begins to thaw, and with it a tide of secrets long frozen in time are suddenly and shockingly unleashed.